In eastern Turkey, a lamb is consumed literally from head to tail, with hardly any part of the animal going uncooked. One of the specialties from the region, particularly in the area around the picturesque city of Mardin, is kaburga – breast of lamb – a cut akin to short ribs that often ends up in the scrap heap in other parts of the world. 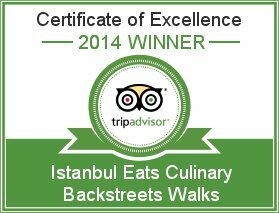 Over at Kaburga Sofrası in Aksaray, an Istanbul neighborhood filled with cheap hotels, seedy internet cafés and a surprising amount of good restaurants, kaburga is given the royal treatment, stuffed with peppery rice and slow-cooked for some eight hours, until the meat turns meltingly tender. 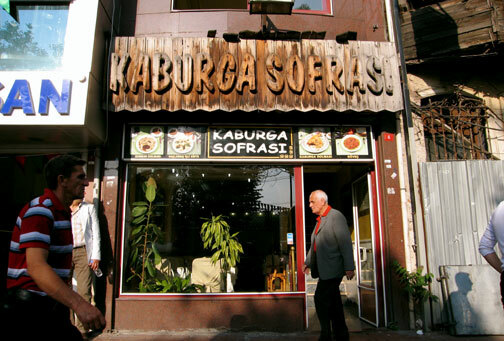 Despite its rib-shack wooden façade and slightly grungy surroundings, Kaburga Sofrası tries to spiff things up, with cloth napkins on the tables and piano music playing over the sound system. The presentation of the kaburga, meanwhile, is done with a flourish: a waiter brings it to the table on a large platter covered with a silver dome, delivering it to another waiter who then takes over, de-boning the steaming, tender meat and shredding it into bite-size morsels. Along with the flavorful iç pilav – the rice that was stuffed and cooked inside the ribs – the kaburga is served with a side of rice mixed with fresh parsley and roasted almonds, which offer a crunchy contrast to the soft meat. Of course, lamb also appears in other forms on the menu. In the içli köfte, ground meat, sautéed onion, parsley and spices are stuffed into a bulgur wheat shell and then poached to make a very large and tasty dumpling. Mumbar, another specialty from the Mardin area, is lamb intestine stuffed with ground meat, rice and mint (and is, frankly, something whose rubbery funk we’ve never warmed up to, as much as we’ve tried). In the excellent and earthy güveç, cubes of lamb, eggplant, tomatoes and green pepper are slowly cooked in a clay pot until all of the ingredients become soft as butter and almost meld together. To make things easy, dessert is limited to one choice: a kind of helva made out of sweetened semolina studded with pine nuts and served warm. It’s quite tasty, but chances are that by this point you’ll be feeling as stuffed as, well, a lamb. 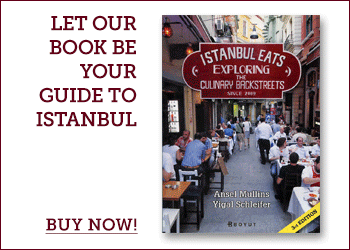 Editor’s note: Since this writing, Kaburga Sofrası has closed its original Aksaray venue and now has branches in the following locations. Came here for supper tonight. I believe this is a new location [Sehit Muhtar Cad. 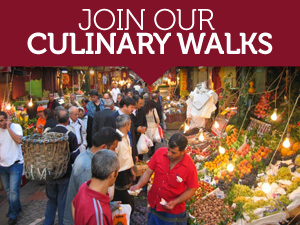 No:9/2] which is a hundred or so meters west and north of Taksim square. Nice lighting, leather banquettes, flat panel tv, vast picture window etc. but it’s still a rib joint at heart. I had the lamb ribs and hummus for 30TL incl. autograt. Ribs were very good, crispy and fatty. I think this is the first hummus I’ve ever had in Istanbul. It was heavy on the garlic and tahini and served with a fluffy flatbread. Damn fine. Wondering if I’m going to have room for my wetburger later.